Muggings on Avenue C, punk bands at CBGB, parties in a nascent SoHo, dropping out from the famous Music & Art High School. In this episodic, coming-of-age memoir, Josh Karlen chronicles growing up in New York’s Greenwich Village and crime-ridden Alphabet City in the 70s and early 80s. 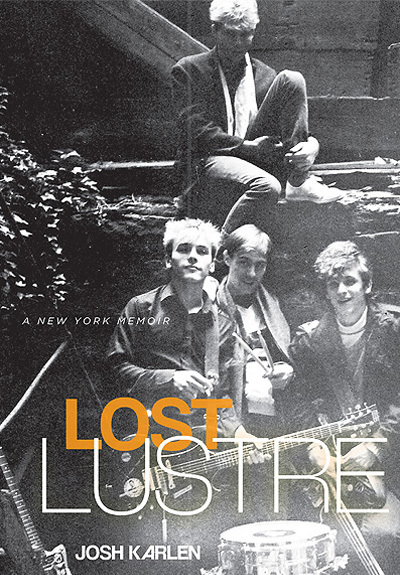 Lost Lustre recaptures a New York suffering its gravest financial crisis and soaring crime, yet staging a spectacular resurgence of the arts. 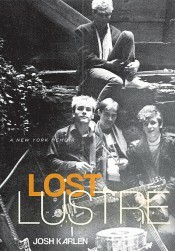 Karlen shares a fascinating personal history of the punk rock scene through the prism of The Lustres, a band that played venues that launched the Talking Heads, Patti Smith and the Ramones. In the title chapter, Karlen poignantly pays homage to the band’s charismatic and talented lead singer, whose life in many ways seemed to mirror his times in both its shining creativity and nihilistically destructive force. Josh Karlen, a former journalist, grew up on the Lower East Side and in the Village. He lives with his wife and two children in Manhattan. He currently works in media relations. Read a sample below and to hear The Lustres perform live at CBGB’s visit the Tatra Press YouTube channel.